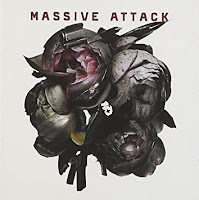 Massive Attack was very influential on the British dance music of the 90s. It's unlikely that Portishead even exists without Massive Attack paving the way especially with the 1991 single Unfinished Sympathy. Massive Attack are from Bristol, England. They started as the 80s DJ collective The Wild Bunch led by Nellee Hooper and Robert "3D" Del Naja who was a graffiti artist before he got into music. When Hooper left The Wild Bunch to form Soul II Soul in 1988, Del Naja, Grant "Daddy G" Marshall and Andy "Mushroom" Vowles formed Massive Attack. They released a single independently and Neneh Cherry liked it enough to get them a record deal with Virgin. She also invited them to record in her home studio. Neneh and her producer husband Cameron McVey supported many emerging groups. They recorded the 1991 album Blue Lines. They usually brought in guest vocalists. In the case of Unfinished Sympathy, the singer is Shara Nelson who knew Massive Attack from The Wild Bunch days. The video is also interesting as it is a tracking shot of Shara walking through the West Pico district of Los Angeles. It was shot by Blue Velvet camera operator Dan Kneece on Steadicam. The "hey hey hey hey" is sampled from The Mahavishnu Orchestra song Planetary Citizen and they also sample JJ Johnson's music from the 1974 film Willie Dynamite. The song charted in England and was popular in dance clubs. It's also a very influential on subsequent groups that emerged from Bristol in the 90s. Shara went on to a solo career. The other guest vocalist on Blue Lines was Jamaican legend Horace Andy. Tracy Thorn of Everything But The Girl was the guest vocalist on the 1994 album Protection. Sinead O'Connor has also worked with them. Massive Attack has released five albums. The most recent was released in 2010. This comp is a good intro to their music. They occasionally reunite but mostly the guys have other projects going on. They are revered in England as innovators. Here's the video for Unfinished Sympathy by Massive Attack featuring Shara Nelson.